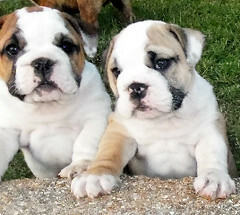 Of all the Bulldog breeds, the English bulldog is probably the most synonymous with the breed. While Bulldogs were originally bred purely for fighting and grew in fame owing to their intense, blood-thirsty fierceness during the hay days of Bull-baiting and other dog-fighting sports, they were later bred by admirers into calmer, family dogs to save them from extinction once bull-baiting was banned from the streets of Rome. Over the centuries, they have become popular pets for many families these days due to their calm, placid natures. While they are probably not the politest of dogs, the Bully’s sure have captured many an imagination. They were called the ‘Churchill’ dogs during WWII because of their courage. The typical English Bulldog is short and stout with a medium build. They are known for their stocky build, loose skin and stubby legs. 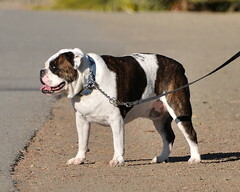 They usually have muscular shoulders and slim hind-quarters, along with the famous wrinkles that Bulldogs are known for. The face is usually large as compared to the rest of the body, with big, wide-set eyes and short muzzle in the name of a nose. And more often than not, you can see the front teeth protruding outside his mouth, making him look more deadly than he really is. Another characteristic that is synonymous with this particular breed is the wide, protruding lower-jaw. This helps them get a strong grip and can result in one deadly bite when required! There is no specific color that English Bulldogs come in. They come in a variety of shades: bridle, white, red, fawn, fallow, piebald, soft yellow and/or a combination of these colors and others. Bar the carved-in-stone-bad-tempered expression, English Bulldogs are fairly mild-tempered and docile in the home environment. As with all bulldogs, their expressions are usually more ferocious than the dog itself. They make for great family pets and are fantastic for apartment living, because of their calm temperament, ease of grooming and care, and the fact that they need very little exercise on a day-to-day basis. 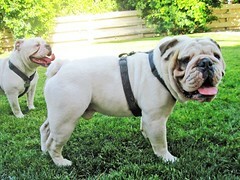 The English Bulldogs know their place in the human circle and love being around their human families. They are happiest dozing in their favorite nooks and crannies around the house. While they may need long periods of rest to feel rejuvenated, they are more than happy to jump around and play with the kids. But they get tired easily after short bursts of excitements, so they also make great companions for the elderly. Do note that they can be quite dominating, tenacious and stubborn (that ‘sourpuss’ expression is not for nothing!) when required and need to be trained early and well! They make great guard dogs, and will protect what they think is theirs, including what they believe belongs to their human family and fiercely so. Try wrenching Molly’s favorite stuffed toy from that death-grip of a jaw and you’ll know without a doubt what your favorite pet will do to intruders and other people he considers a threat. Genetically, English Bulldogs are prone to a gamut of skin and respiratory disorders. Some of the skin-related ones that need a special lookout for are: dermatitis, eczema , acne, skin allergies, seborrhea and other skin related health problems. More often than not, the English Bulldog suffers from breathing difficulties because of the shape of its muzzle. They will also have problems breathing through their noses, and often end up breathing through their mouths, making it seem like they are panting all the time or trying to cool off by letting the excess heat out of their bodies through their mouths. Some of the common respiratory issues that they face are: Brachycephalic, and other respiratory problems and breathing disorders such as snoring and partially blocked passage-ways. Speaking of mouths, the English Bulldogs also suffer from a variety of mouth and throat problems such as deformed, misshapen or misaligned teeth, which can cause them a lot of pain while chewing etc. and thus prevent them from consuming a healthy diet. 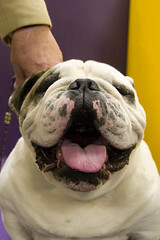 You can read more about Bulldog Health problems in the related section. In daily life, the only care that the English Bulldog requires is the cleaning and care of the folds of facial skin. His wrinkles need to be cleaned, wiped and dried every single day. Give your dog’s coat a thorough once-over every night before you put him to bed to ensure that you haven’t missed anything that may need immediate attention. And although they may seem very averse to it, your pooch DOES need that daily walk in the park to prevent the early onset of arthritis. Make sure your little pooch drinks plenty of water (this may require some coaxing on your part too!) and stays cool. Also, since this breed is very prone to over-heating, it is imperative that you do not leave your pet in any place which may cause such a state of affairs. On the other side of the coin, due to their odd shaped muzzles, they are equally prone to respiratory disorders and must be kept warm and protected during the cold temperatures too. They are prone to colds and coughs and these conditions will aggravate any respiratory troubles they may already be suffering from. And of course, let’s not forget the snoring. 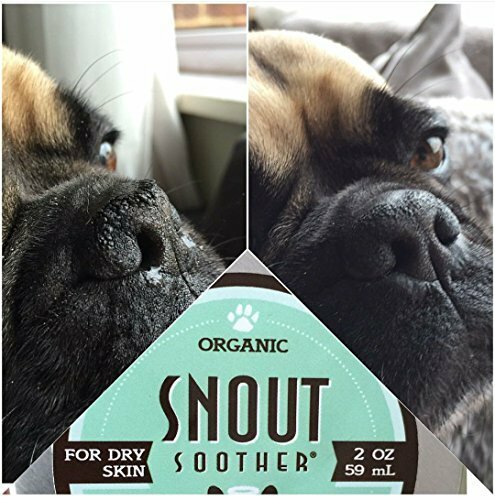 Their short, compact snouts make them the ideal candidates for snoring and clumsy, messy eating. So it takes a patient master to clean up behind your bulldog after each and every meal, while struggling to get sufficient rest in that one-bedroom apartment with your pet snoring louder than the upstairs neighbor. Apart from that, they are very easy to maintain as long as you make regular trips to the vet and ensure that all his shots are up-to-date. They do not require very frequent baths, but their coats must be brushed at least 2-3 times a week preferably. 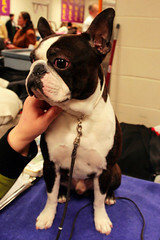 Nails and Tails must be groomed on at regular intervals or as advised by the vet. 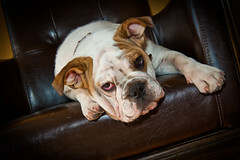 English bulldogs are one of the most stubborn amongst all the Bulldog breeds. They will fight back during obedience training and how! You need to catch them young in order to inculcate those good manners. But once trained, they are a pleasure to have around. They get along fairly well with other pets in the family as long as everyone knows who the Alpha Dog is. They have natural leadership tendencies and will only surrender their leadership to their human masters. Once you can get their respect in this regard, training them will be fairly easy, but will still require a lot of patience. 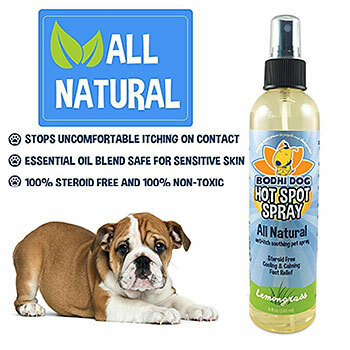 Most bulldog owners who shower their pooches with excessive love and affection and treats have to suffer a dominating, badly-behaved pet how will end up ignoring several commands. If you want your English pet to be trained properly, don’t encourage his bad behavior. Remember, you’re the master and he’s the dog. Remind yourself from time to time and you should be fine with your little Bully (no pun intended! ).